The ARRI LoCaster LED Kit is a small, lightweight, continuous light source with 6 color temperature choices and True Match LED technology with consistent output. The natural light characteristics of these panels work well with available/existing light and consume relatively little power. 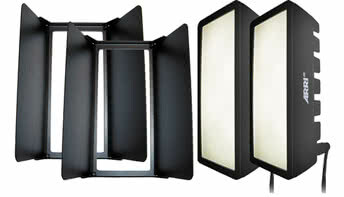 These lights are ideal for TV broadcast, filmmaking, portrait work where a natural light look is desired, or in any situation where cool-to-the-touch lighting is necessary. Weighing just two pounds per head, the kit can be powered by the ARRI Locaster Battery Set for a lightweight, portable and wireless setup. • These lights require grounded power outlets (power cords included) to run. These continuous lights natively change color temperature. • These lights come equipped with built-in dimmers and are not compatible with the 1000 Watt Rotary Dial Light Dimmer for ARRI Lights.